On behalf of Janus Team, thank you for showing up. Moderation will be performed by @marenkar ! Welcome everyone to the QA with the newest member of the Janus team, Mr. Alphonso Morris Jr @almo3ree23! I have personally verified his information to be accurate based on several techniques to prove identity. Without further ado let’s get to the questions. Please remember, we need to screen questions first so please post your questions to #janusproject. If they are approved, I’ll ask them here with a tag to you. Who are you and what is your career experience? 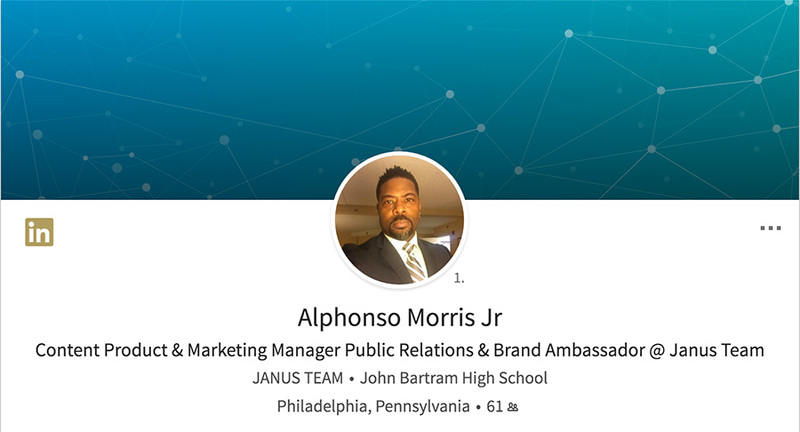 My full name is Alphonso Morris Jr.
I’m 51 yrs old. I was born in Philadelphia PA and currently live here. Philly sounds like a great place! I have several years of experience in various fields not as much in the Crypto / Blockchain world more so in the fields of Photography, Event Planning & Promotions. Public Relations Director, Artist Management, Personal Assistant, Music & Television for over 20 yrs. 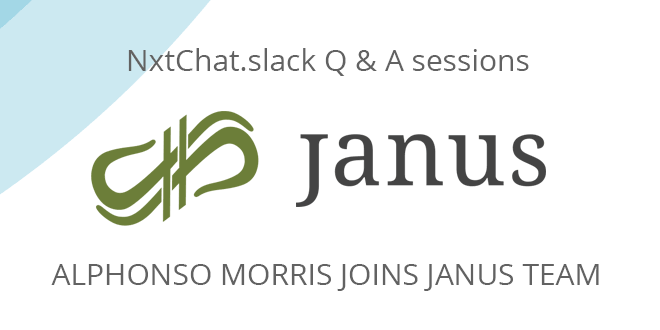 A lot of people on #janusproject are asking, how did you meet the Janus team? It’s a funny story….. I met Bjorn’s wife at an event, I was working in Bethlehem PA, there’s a Casino built on the site of the famous Bethlehem Steel Co. I met her a few years earlier. She wanted me to meet her husband for years. She happens to drag him out of his cave for a little R&R. After the show, we met for drinks and hit it off. It didn’t take long for us to connect and discuss life, family, work etc. Louis & Robert [also from the Janus team] I met later. That’s awesome! Nice to know that there’s a good personal relationship as well. They’re a great team to work with. @crowne asks: Is Nate Morris from Boyz II Men your brother by blood relation? Alright, another common question on #janusproject is – “What ways will you help the Janus team expand grow as both a team and future company”? Explaining how good something can be to others is easy when you have a team & product as good as this. We’re all driven to succeed focused on producing quality, I believe creative minds tend to work well together. My interactions with members of the team has been very good. I believe my 30 plus years of public relations, world travel, and personal contacts will benefit the team as we grow. I’m anxious to get into the creative process. Sounds great! Looking forward to seeing what you can do with Janus. We have another question as well from @merk: given your association with Boyz II Men – “Who is the most influential person you have ever had the privilege of meeting”? Oh and Salt&Peppa were there as well! Question from @qiwoman – “What advice do you have for potential investors looking at JANUS”? I joined the team two months ago and my observation of Janus is that it’s a solid company. They have good direction, good products, dedicated to their investors and their brand. Janus is also growing exponentially. From my personal experience, we are only as good as our word on any level. Information is power in the right hands coming from the right people. I’ve earned mutual respect from some influential people in the entertainment industry who I’ve worked for or with over the years. People like ( Ken Ehrlich ) Tv Producer Grammys, AMA’s Etc. ( Usher Raymond ) Music Producer / Entertainer I consider close contacts. There’s always the possibility of an outright endorsement of a product, company, idea or the like based on how Bjorn wants to proceed. Whoa, that’s quite a list of contacts to bring. Nice! She was on The Evolution tour with Destiny’s Child and Boyz II Men in 1997. I was their personal photographer during the tour. Speaking of blockchain, another question that’s asked on #janusproject is “Had you heard of Bitcoin or Blockchain before joining the Janus team”? Yes in my travels abroad I noticed it being used but that was the extent of my Bitcoin or Blockchain knowledge. It didn’t take long for me to start asking questions. I’m not a religious person per say but I can say I’ve seen the LIGHT! Yes with my contacts in music and television it wouldn’t be a problem for me to explain Janus to as many influential people and companies as possible. @cryptoracer asks: What areas of marketing and promo (and to what demographic) do you think will benefit Janus the most, re. exposure? The primary marketing angle will vary based on the business type, for example, our Forex/Crypto mainstream site from this year will be tackled literally by the main stars of that site, chiefly the wave callers (professional traders). Money and personal fame is the driver. In terms of year 2 adoption, we will be using creative methods to introduce general mainstream users to our token(s). This is something our team excels at and keeping the tech out of the equation will be always primary to reduce barrier of adoption. What will be the main marketing angle for Janus project, what is the plan of delivery and what are the ballpark estimates for year 2 adoption in mainstream? I’m very visible in the entertainment world, I travel regularly so I can tap into the international markets, I’m experienced in promoting products, and have a respected following. A great question by @martis (and earlier by @wolffang), speaking of Nxt – did you try to play with Nxt features? And if yes, what is your first impression? Yes, I have it installed and have looked at it. It’s a very powerful platform! I’m still wrapping my head around some of the features, but I’m still learning. A casual question from @wolffang – What is your favorite place to spend the holidays? What is your projection of JANUS 12 months from now? I can project that it will be the number one token in the market! Just my personal opinion based on my observations and markets. This is obviously highly speculative, but we believe that our tokens can appreciate in value almost by sheer force of work and business success. A store of value backed by our team can only stay at one value so long if we keep our roadmap and vision strong without becoming complacent. I’ll be the first to tell you that my goal is empire level, and you don’t get to that point without drive and ruthless ambition. A great question from @merk -“With the upcoming formation of FL3X (the Janus parent company), what role will you play in the formation and what position will you hold (if that has been discussed)”? Company brand ambassador to start, we’re still forming positions but eventually partner. Awesome! @martis is also asking how you will be promoting crypto tokens to people who aren’t familiar with the technology and the community? I’ll be promoting thru my contacts in mainstream the business sites we develop. Those business sites will be using our tokens in both direct and indirect ways. I’ll be facilitating the communication with these people in order to partake in the use of the site or promote the site itself. Ok, we’re at an hour now, so I’ll close it off with this question – How long will you be staying with the company and team? Do you plan to become partner and see it develop into what the Janus team has described? I’m here for the long haul. I never run away from a challenge. We have great things planned for the greater community. We want to make Janus a household name. And yes I will be a full partner in this endeavor. Awesome. Thanks to everyone who participated in this Q&A and thanks especially to @almo3ree23 for coming on here and answering all these questions. Thanks again to Janus for choosing Nxt! Thank you all for coming out to meet Alphonso today, as always thank you to the community for the strength you help give our project and team. Press releases will follow shortly and a giant thank you to the NXT foundation for helping with everything today, including the ID verification of Mr. Morris.